There are some fibers in the apple cider. So… Should I shake the container before mixing it? Or do I need to filter them out? Haha. I’m still new at this. PB says: Apparently, those fibers or “mother” are what make Braggs or any organic apple cider vinegar effective so, I read once that you should shake it up and then put some on the cotton pad, and use the other side of the pad to wipe over your face, if the fibres bother you. I personally just use it as is and its fine. Hope that helps! Haha. Thanks so much. I’m using Solana Gold ACV. Hope it’ll clear up my stubborn spots because most of the toners I’ve tried don’t seem to work. You’ll definitely get an update from me. PB says: Apparently, so long as its unfiltered it’ll work. Do let us know how it goes. I’ve been using the apple cider vinegar toner for a week now. And I say, I’m impressed by the results! I stopped getting rashes on my face. You know, those little itchy bumps that appear on places like your forehead. Also, my acne seems to be clearing up. New spots stopped appearing for like…. 5 days now. And my existing spots are starting to heal. That’s the downside of having fair skin. I don’t have much acne. But when I do have them, it is very obvious. Little red dots on white face. Haha. I mixed it with cooled down boiled water last week. So now, I’m making my new batch with green tea. It took a little getting used to. Because the smell is so strong. But look on the bright side. The smell cleared my blocked nose. – 1 teaspoon of ACV. Drink it in the morning when you’re having breakfast. A great way to start your engine. PB says: Yay! I’m glad it worked for you. Its pretty awesome eh? And thanks for your recipe for drinking it too! I will start using acv toner for my clogged and open pores. I usually use grape seed oil as a night serum. Can i use it after the acv toner? I’ve used BRAGG ACV for a while. You take a shower and dry yourself. get a basin and fill it halfway with warm water. Add a half cup of ACV (shake it first) and mix. Take a face cloth and dip it in the basin and scrub your whole body, go light on face, is important to dry yourself with your hands (don’t use a towel) by rubbing them against the body until you are dried. You are going to see your skin peeled off when you start to dry up. Do this, and you will see that after a while your face and body will shine like an apple. It works. thanks for the recipe on how to make ACV as a toner and morning drink. I will make my own toner tomorrow, hope I can find an organic ACV. Wish me good luck! Suddenly I have Alipicia and after all the blood work has come back negitive( Auto-immue,thyroid,hormones) I have been told to take organic ACV and with sage tea( still looking for that) I should use it as a rinse to even the PH of my scalp.Anyone ever use ACV for that? But it does really make your hair feel clean and soft. lynda: I never thought of using it to balance scalp PH but since vinegar is acidic I’m sure it’ll work. Besides if you go for organic apple cider vinegar, its probably better for your hair and scalp than using chemical shampoos. Do let us know if it works for you after you have tried it. I tried the no-poo routine where you replace your shampoo with baking soda and ACV and it did wonders for my hair and I haven’t bough shampoo in 3 months now. Hello everyone, I just had an idea to use Braggs Apple Cider Vinegar with a cotton pad straight on my face. Have been doing it for 2 days. My dark spots on either side of my face and my dark circles under my eyes are clearing up. I did not mix it with anything. Just straight out of the bottle. Try it, this stuff is awesome. To God Be the Glory for his all natural cures. In Jesus name!! Stinks like all get out but it leaves my skin terribly soft and the pigmentation problems are being corrected. I use Bragg ACV and Emu Oil daily and my face is clear. I apply the ACV directly on my face with a cotton ball, let it dry, and apply the oil. I have suffered with cystic acne for over 15yrs. and have seen many dermatolgists so believe me this stuff works. You have nothing to lose but your acne and the ACV costs less than $3.00. It’s way cheaper than an office visit and medication. Also, remember this is all natural so it might take longer for you to see improvements. Um.. but would’nt it make your face… sticky or ‘sweety-sourish’ after using the Apple Cider Vinegar?? i wanna give it a try, but should I use a moisturizer after that? @Abby : Actually, no it doesn’t leave the face feeling sticky. Just very clean. When I use it, I do use a moisturiser after that. It can be drying. and i think it’s tasty! :p hehee… but too much will make your throat feel wierd.. ‘tingly’ is the word to describe it i think! I thougt i had a disease or something… i scared the day lights out of myself. So then i turned to the internet and i ended up here~! This is awesome~ malaysian women who have gone through the same thing. oh ya, i was at this website fatfreekitchen. And it said that sodium chloride and some isopropyl can cause acne??? But when i see the ingredients on stuff, and facial wash, most of em have it! =_= … so i tried to find something that doesn’t have those stuff in it… then i found Organic Aid vitamin E foam wash that say it’s hypoallergenic & non-comedogenic… has anyone used it before? is it really working? this ACV..? is it suitable for any skin type? and it should only be worn at night? 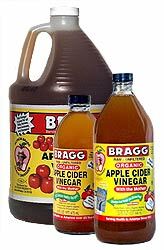 where can i purchase the Bragg ACV? i would like to try..
@lilac : Try any organic food store or even supermarket. Honestly I’m a little skeptical of trying this. It just seems like the acidity from the apple vinegar would burn and irritate your skin, making it worse. I’ve just broken out on my forehead and I used to have really nice skin. I don’t know what the cause of it is but will this help? It might burn a bit with the first application but you will not regret what this stuff does for your skin. Apply at night before bed if your hesitant. Greatly appreciate all the posts, comments and recipes that people freely share to help others. I’m one that tried almost everything, spending way to much on overrated products. Dont hesitate, try it you will like it, so thankful I did. My skin looks great again !!!!!!!!!!!! Thank you everyone !!!!!!!! @Rebecca Hubbard : Actually you are recommended to dilute the vinegar with water – 1 part vinegar to 1 part water. It has helped me and many other girls. I can’t believe it. I’m going through the same thing. I’ve all of a sudden broken out on my chin. I’m skeptical about trying acv toner. Although I was thinking about doing acv w/ water, and then using a moisturizer that has green tea in it. Hopefully it’ll work. Thanks for the advice. 3. Use as you would a toner after cleansing and before moisturiser. Erm its bugging me too can i make it once n use it for the week or longer? How long generally can we keep tis? Once you make it you can keep it up to a week. Preferably not longer and it is best made and used fresh. hey, ive got a question?…would ACV work as well with men…?plz need an answer friends.. I don’t see why it shouldn’t.